I am certain there are many Toms who are turkeys. 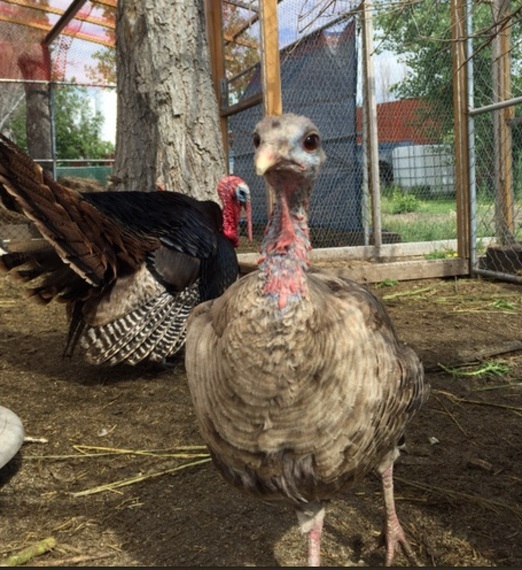 I know there are many turkeys that are toms. I love turkey and I love turkeys, if the dichotomy can still be permitted in this day and age. Comical, colorful, picturesque and grand as is our land, turkeys are the unsung swans of the open fields. They chirp melodically and their guttural cacophony we have immortalized with the famously phoneticized "gobble, gobble, gobble." Turkeys possess sound traits and imagery that are emblematically, accessibly American. Equally iconic as five-fingered hand paintings or as centerpiece transfer art on grandmas' massive ceramic platters, turkeys are the warm-fuzzy counterparts to our loftily regal national bird, the bald eagle. 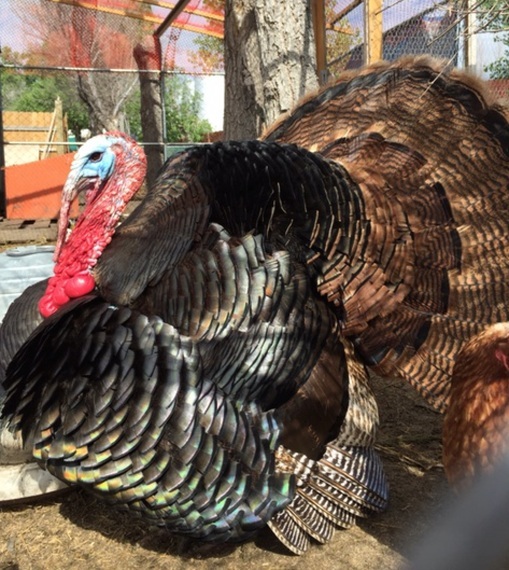 Turkey Luv I: I fell in love with an endearing tom last summer in Colorado, on a final stop of a two-week long cross-country camping trip that took us to the Grand Canyon and back, with numerous stops in between. What a glorious chunk of land this continent is. The tom, so civil and convivial as to take bread carefully, delicately from my fingers, strutted and preened for me and performed a slow 360 as I filmed him, a massive, feathered ball of a ballet dancer in his wire pen, his scraggly harem curiously looking on as he showed us what a fine specimen and boss he was. For a while, I even contemplated installing a turkey pen in our wooded backyard - but practicality and wisdom got the better of me, one who doesn't even go so far as to commit to a dog - our two beloved cats with their minimal needs and maximal snuggle return sufficing nicely. 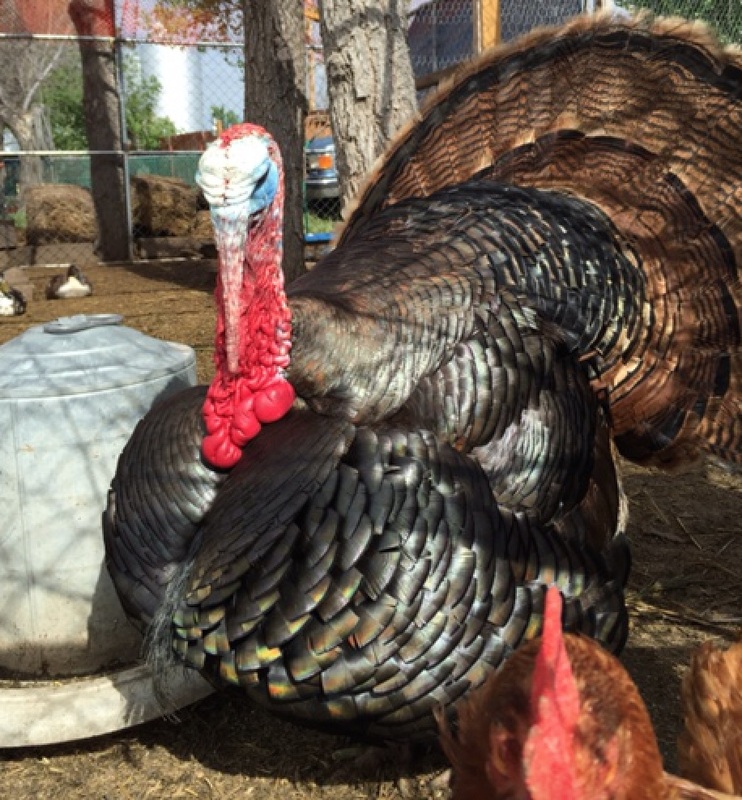 Turkey Luv II: I call myself an omnivore, but I am not a foodie. I don't live to eat. I enjoy all food genres and so refuse to pencil myself into any category, be it health or philosophically construed. Alles mit Mass und Ziel is how I prefer to handle the consumption of edibles: Everything, but in good measure. Remember A Christmas Story's turkey junkie father? I embrace that role. Neck to thigh to skin and everything in between. Given the choice of pies or sweets or turkey, I'd take the meat. And finding the biggest fowl at the store is lit homage to the prize goose Ebenezer Scrooge purchased in Charles Dickens' A Christmas Carol. I also honor turkey as Ben Franklin's first choice for national bird, which further honors that proverbial person, living or deceased, I would choose to have lunch with. I bet Ben was a riot. I love preparing the whole holiday meal and use time-honored, simple recipes. I have done it alone many times and was/am totally cool with it. The meals I have prepared together with loved ones are among my happiest holiday memories of all. The mother of all turkey days is obviously Thanksgiving Day. Less saddled with religified ownership debate than other big holidays due to its having been concocted in the last few hundred years, Thanksgiving exists as a rare, US-founded, legal holiday open to as much or little divinification as any group of celebrants chooses. Indeed, as the smoothed-over, white washed story goes, it is about a group of people choosing to express their thanks in the company of different others, in a moment of peace and camaraderie. What a concept. Thanksgiving Day is also thankfully devoid of the costly and mostly useless practice euphemistically called Gift Giving, which in reality is called Buying Stuff. At least so far, no magical turkey-on-a-shelf-type kid's book has been published to further stress all those well meaning but over-indulgent, over-worked and harried parents out there. The day remains for all purposes more skewed to the giving than the getting, whether it's home n hearth or donated funds. Though Thanksgiving boils down (idealistically) to making merry, the effort it takes to "celebrate" - to fund, serve and bring it all together - honors quite succinctly the ideals of our capitalistic, bread-basket democracy. So be it. I have scraped together dinners when cost was an issue; I have created dinners when cost was not. I am keenly aware of the have/have not duality of this event, manifested in the primal awareness, Hunger - Hunger as felt in the belly, hunger as felt in the heart. My half-c+ on this beautiful but so sadly abused Earth of ours has granted me enough full circle awareness to sweeten the gratitude: I am thankful I can feel thankful.